The causes that underlie the association between depression and diabetes are also unclear. Data suggest that women, those living with other comorbid conditions (eg, heart disease), and those from poor socioeconomic classes who have diabetes are more likely than others with the disease to suffer from depression. Studies have also shown that diabetics with a history of depression are more likely to develop diabetes-related complications than those without depression. The American Diabetes Association recommends that physicians incorporate psychological assessments and treatment into routine care rather than wait for the identification of specific problems or deterioration in psychological status. “Several self-administered depression assessment questionnaires are readily available for free, such as the Patient Health Questionnaire-9,” says Dr. Polonsky. 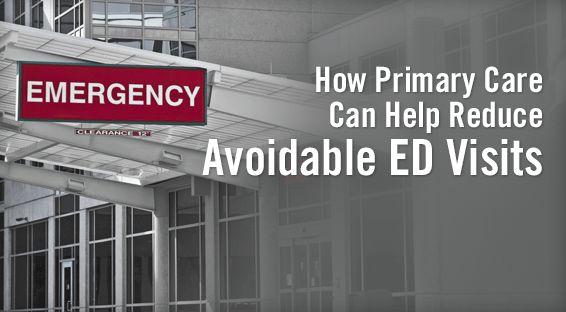 “These tools should be incorporated early in the management of patients with diabetes.” Physicians should seize opportunities to screen diabetic patients for their depression status at diagnosis, during regularly scheduled management visits, and during hospitalizations. They should also screen for depression when discovering diabetes-related complications or when problems with glucose control, quality of life, or adherence are identified. Treatment for depression may also help people to more easily follow self-care recommendations. In turn, this can have a strong impact on improving quality of life. Treating depression with psychotherapy, medication, or a combination of these treatments may improve patients’ well-being and their ability to manage diabetes and its complications. 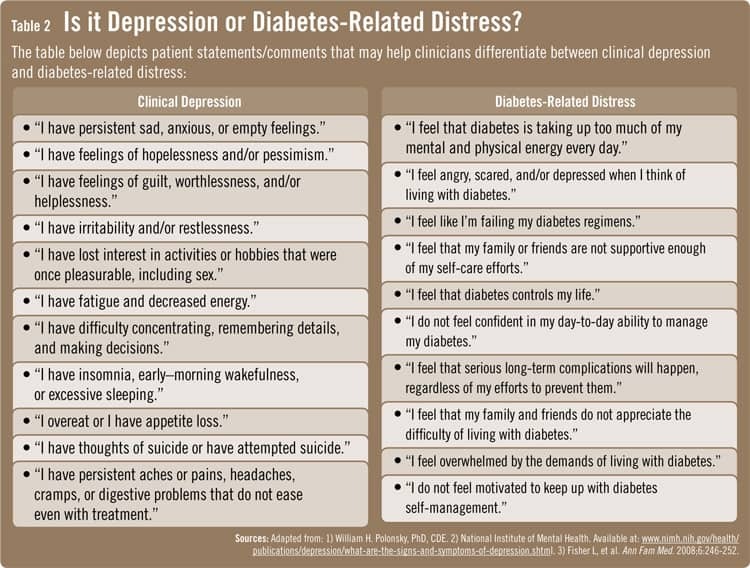 When treating depression in the context of diabetes, patients may also benefit by receiving care from mental health professionals who are in close communication with physicians who are providing diabetes care. “There are mental health professionals that specialize in treating people with depression and co-occurring physical illnesses,” says Dr. Polonsky. “These specialists should be incorporated in patient care when needed, particularly for patients with diabetes who are at higher risk for depression.” Patients should also be asked to report any herbal supplements that they may be using to address depression. This is critical to ensuring that no harmful interactions occur with other medications involved in diabetes regimens. American Diabetes Association. Standards of Medical Care—2010. Diabetes Care. 2010;33(Suppl 1):S11-S61. Available at: http://care.diabetesjournals.org/content/33/Supplement_1/S11.full. Polonsky WH. 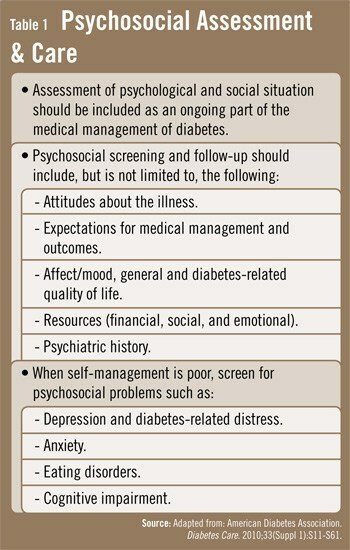 Emotional and quality-of-life aspects of diabetes management. Curr Diab Rep. 2002;2:153-159. Fisher L, Glasgow RE, Mullan JT, Skaff MM, Polonsky WH. Development of a brief diabetes distress screening instrument. Ann Fam Med. 2008;6:246-252. Bot M, Pouwer F, Ormel J, Slaets JP, de Jonge P. Predictors of incident major depression in diabetic outpatients with subthreshold depression. Diabet Med. 2010;27:1295-1301. William H. Polonsky, PhD, CDE, has indicated to Physician’s Weekly that he has worked as a consultant for Roche, Amylin, Eli Lilly, Nov Nordisk, sanofi-aventis, and Abbott.